Dogs see the world quite a bit differently than we do. First a few facts. A dog’s acuity, the ability to see clearly, is much lower in bright light than is a humans. It is a generally accepted fact that a dog’s vision is about 20/75, as compared to a human’s 20/20. 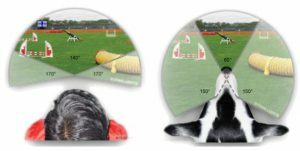 This means that an object a dog can clearly see at 20 feet, a normal human would see clearly at 75 feet. Dogs do not have the ability to focus as well on the shape of objects. An object a human can see clearly may appear to be blurred to a dog looking at it from the same distance. fiber. All the nerve fibers are bundled together to form the optic nerve. 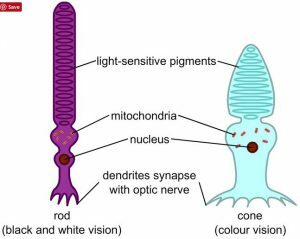 Rod cells are elongated cylindrical cells in the retina of the eye. They are sensitive to dim light but not to color. 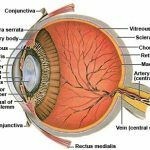 It is the rod photoreceptors of the retina that are necessary for vision in dim light, in dogs the centralis which is 25% of the retina is predominantly made up of rods. By comparison the same area in humans is mainly made up of cones. Merriam-Webster dictionary defines it as. vision in low light then we can. spectrum, blue, green and red.The short wavelength cones are responsible for the blue color. The medium wavelength cones are responsible for the green colors and finally long wavelength light is responsible for red colors. in the top half of the back of the eye immediately below the retina. This is a reflective layer which serves to intensify vision in dim light. The mirror effect of the tapetum results in the “eyes shine” observed when animals look into a car’s headlights. After light passes through the retina, it is reflected from the tapetum back onto the retina so that there is a second opportunity for the retinal photoreceptors to be stimulated. While dim light vision is enhanced by the tapetum, scattering of the reflected light may result in reduced acuity. This is the dogs view of the same chart. Because most dogs’ eyes are placed more on the side of their head than a human’s eyes, they have a wider field of view. This is a trade-off because the more frontal placement of human eyes allows for better binocular vision. 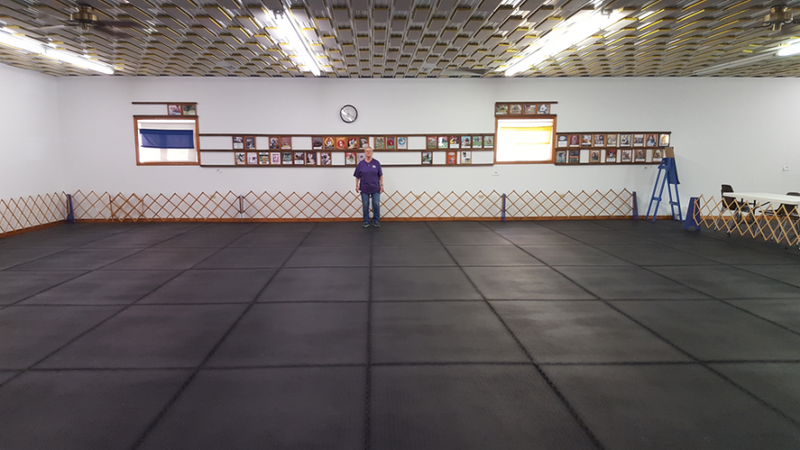 A normal humans view of a 45×40 foot ring. with my android cell phone with no zoom or magnification. The lady in the photograph is approximately 5’3″ tall. From this distance, the dog must go from the stand position, to the down position, to the return to sit position, and finally a recall. All of this must be done on hand signals alone. I reiterate verbal commands are not allowed! All dog training requires good visual connection between the dog and handler, in this exercise however it is absolutely critical. So, knowing what a dog can and cannot see is critical information. We know from the above facts that a dogs’ acuity is about 20/75 and they have dichromatic vision where they can only perceive predominantly blue and yellow. They have no red photoreceptors. So, this is what the same photograph looks like to a dog. So, as you can see training a visual exercise at this distance with the limitation of a dog’s visual capabilities is a challenge! The description of how to deal with this situation is a long one and somewhat proprietary. Perhaps I will cover that in a different post. I would be most happy for you to comment on this article or ask a question. Please reach out to me and I will promise to connect with you. I had no idea, that the colors are so far from what we see. Had heard that they see different, but to actually see it, is amazing. I have worn reds and whites, thinking they would see me, not knowing I’m completely washed out. They don’t see reds, and the white, they can hardly see me. Had a problem, at trial not long ago. Glass was all the way around the building, gloves were placed on the floor, and the sun was shinning in, right glove one was. Of course that’s where the judge wanted, sent and my dog was getting to. Had no idea that he could not see the glove, it was washed out, by the sun. NO IDEA. Very interesting information! Will definitely keep this in mind while trying to communicate with my dog. Very interesting, I never thought that dogs seed the world this way either. It just comes to show another reason why it can be more difficult than you think to train your dog, yet how important it is to know this info as well. It does take a lot of work and knowledge to train a dog and the more we know about them the better. Thank you for the insightful comment.You are correct there is a lot more to dog training than you might think. Not only do you have to do the right thing, at the right time but also do it for the right reason. If you have anyfurther questions please reach out to me, I love to talk about dog’s and dog training. Excellent Article!! I always chose what to wear in the ring based on what I want the judge to see or not see. I will now start to look at my clothing with the consideration of what the dog sees. Thank you for the kind praise. Hopefully this decision on you part will result in higher scores in the future. Especially as you move on to Open (CDX) and Utility (UD). As you know each of these advanced levels of dog obedience competition requires the dog to work further and further away from the handler. As a result, visual information from the handler becomes more and more crucial. If you have any further thoughts or comments I welcome your input. The vision article was excellent and I really liked the getting my dog to stop jumping on me post. Jill chewed up my nylon leash and it was to short anyway. What leash would you recommend? Thank you for the positive review of the vision article! The training your dog not to jump on you post, is a great place to start. Yes, you need a good leash to train your dog with. I would recommend. Thank you, for recommending the leash, I will be ordering one as soon as possible. You are most welcome. Make sure to come back and tell us all about your new leash!